Exterior doors are the entrances and exits to a building or a home. Ideally, these will be solid core doors with strong locks for increased security in New York. Doors that are made from inferior materials like fiberglass can be easily smashed open. With the way criminals in NYC behave, you should not put such a possibility past them. Solid wood doors and even reinforced doors are available. The professional service staff at Hulk Security Systems will be able to help you decide which exterior doors will be best for your situation. Our locksmiths are ready to install the exterior doors or make any necessary repairs as needed. The strength of the door is one thing. You should try to get strong exterior doors. You will want the strongest locks for these doors. Again, our technicians will be able to make excellent recommendations and install one of our many door locking systems. The lock is what holds the door in a position that remains closed. This is the way you want it to be. It would not be fun to have anyone enter your house when they want to, especially burglars who are experienced with open door locking mechanisms of all kinds. 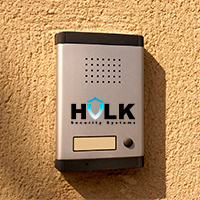 At Hulk Security Systems we stay ahead of the threats and offer door locking solutions that last. Security in New York doesn’t get any better than this. Once you have strong exterior doors in place with high quality locks, you will be able to feel safer in your home knowing that you hired the best in NYC to handle your security needs.